In September 2009 I had a chance to make a brief visit to the Griffith Observatory, located in Griffith Park in the Hollywood Hills. The Observatory originally opened in 1935 and recently underwent a massive restoration project. It's back to it's former glory and well worth a visit. Plus, admission and parking are both free. Nice. 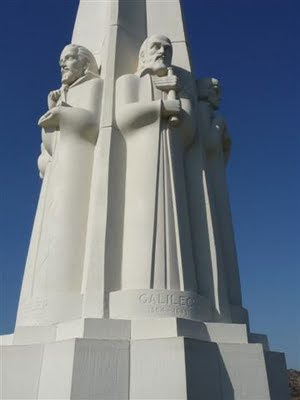 Outside of the Observatory is a large statue featuring Newton, Copernicus, Galileo and other astronomers. Inside you'll find a Foucault Pendulum. It's movement is based on the earth's rotation. There's also some incredible murals, including this ceiling fresco in the central rotunda. There are numerous displays on the solar system, the Milky Way galaxy, and the universe. "The heavens declare the glory of God; the skies proclaim the work of his hands" wrote the Psalmist. As a Christian, I'm reminded how the night sky and the universe itself points to a Creator. One hundred years ago, the majority of astronomers believed the universe to be eternal. The Big Band theory, now the accepted understanding of the origin of the universe, shattered that long held belief in an eternal universe, and sounds strangely like Genesis 1:1: "In the beginning, God created the heavens and the earth." Over the years, I've appreciated hearing from and interacting with university level scientists who've found that the scientific evidence actually points to a Creator. While the Griffith Observatory doesn't formallly make mention of the existence of "The Beginner" - that is, the One who began it all - it does acknowlege "The Beginning" - what is known as the Big Bang. In terms of the history of science, this is both a relatively new, yet very ancient, understanding of the origin of the universe. More displays, this section on the sun and stars. I understand the Observatory is at lot more crowded in the evenings, especially on weekends. The last time I was up here at night was for "Laserium" (anyone remember that?) in the mid-1970's. Still more displays downstairs. This focuses on our solar system. There's a lot more to see, including an excellent planetium show which my wife and kids and I saw last year. Outside, much of the building is accessable. The Observatory sits on a hillside on the eastern edge of the Santa Monica Mountains, and is visible for miles away. There are also some incredible views of the city, which alone make it worth a visit. This is looking past Hollywood towards downtown Los Angeles - about eight miles away. A group of German tourists enjoying a view of the Hollywood sign on nearby Mt. Lee. Twenty five years ago I actually hiked up to the Hollywood sign, something I would absolutely not recommend today - it's illegal and the police will respond. Here's another link to a previous blog post on the best place to (legally) view the sign. "No sciences are better attested to than the science of the Bible ... This most beautiful system of the sun, planets, and comets, could only proceed from the counsel and dominion of an intelligent and powerful Being.... This Being governs all things, not as the soul of the world, but as Lord over all; and on account of his dominion he is wont to be called Lord God." Sir Isaac Newton; Principles. Here's a link to the Griffith Observatory website.